Park at The White Hart, The Green, Pirbright, GU24 0LP. Food is served until 8:00 PM Mon-Sun. Cross the A324 to take the side road signposted Parish Church, and walk along this road for about 200m. Enter the graveyard on the right. See the granite lump marking the grave of Stanley and continue along the graveyard path, past the church’s south door and out to the footpath beyond it. Turn right and walk along the path between fields. Cross over a road and take the public footpath through the wood. Ignore a side path on the right towards a children’s playground, and soon reach a road junction. Cross Gole Road carefully. Take the left hand footpath under the railway arch and then immediately bear left to cross over the Basingstoke Canal at Pirbright Bridge. Do NOT take either towpath but continue along the pavement on the right hand side of the road. Just after the two driveways at the bend, turn right onto the marked footpaths. Take the left hand footpath until there is a wire fence to your right, but turn right before the fence to reach a pair of wooden gates leading into Sheet’s Heath. The path through these gates climbs a hill, merges with another path from the left, and reaches a narrow tarmac lane. Cross the lane to follow the wide track beyond the gate. Ignore the many side paths until, after about 500m, you clearly see telegraph poles in front of the boundary trees to your right. As the current track reaches its closest point to the telegraph poles, turn right onto a path that cuts through the heather to the poles. Pass through a kissing gate and turn right onto a wide track. At a junction after 60m go straight ahead onto a road that passes another telegraph pole (right) and Sheets Cottage (left). The road descends and then rises again to reach the canal. 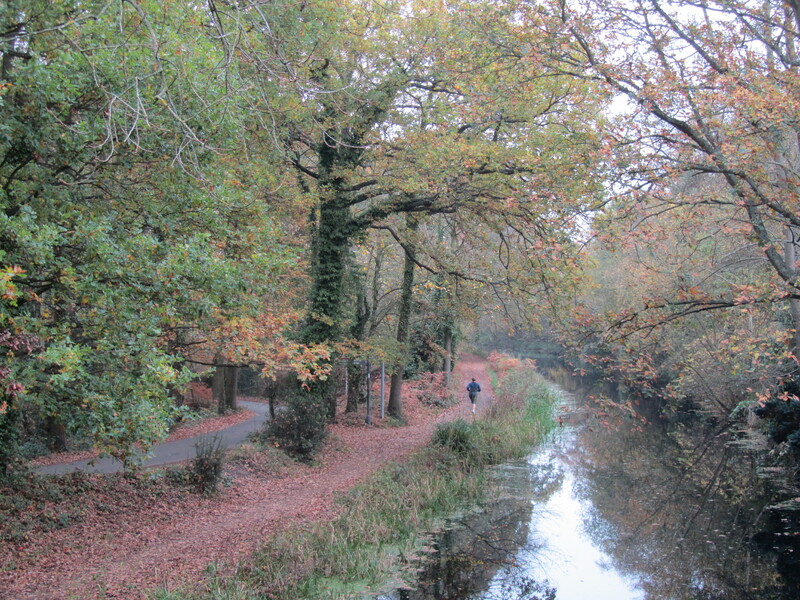 Bear left with the road and join the Basingstoke Canal towpath, popular with ducks. Pass under the cart bridge and keep ahead, passing locks 14 and 13 after 380m and subsequently reaching lock 12. At the far end of lock 12 turn right over the footbridge to descend under the A322 via slightly obscure steps, and continue along the good quality towpath with the canal now on your left. After about 1km pass houses but continue along the towpath to proceed under a road bridge (Hermitage Bridge) and subsequent footbridge, eventually reaching Kiln Bridge on the main road through St John’s village. Turn right. Ahead you will see two post-boxes, but you immediately turn right again along the pavement. In 60m, at a junction, cross the road to proceed along the tarmac track opposite, with the park and playground to your right. Keep ahead into woods, and in 400m cross the footbridge over the railway. At the end of this footbridge immediately turn right over a stile and follow the path parallel to the railway. This path emerges onto the golf course but continues along the right hand edge until a signpost directs you to bear left across the golf course fairway on a slightly raised grassy path, passing a bunker on your left and crossing another fairway to reach a strip of woodland. Keep following yellow arrow footpath signs over two more fairways, then through a denser wood. At the end of the path through the wood, turn left to reach a road. You have reached the half way point of the walk. Turn right and proceed along the right hand edge of the road, taking care as there’s no pavement. On reaching a bend, cross to a safe pavement to go under the railway arch. 100m later cross back to the right hand side of the road. On reaching a pavement, keep right at the junction but then immediately turn right to descend to the towpath. Retrace your steps to the cart bridge via Hermitage Bridge, the A322, the footbridge and the three locks. 50m before the cart bridge, bear right onto the road in order to cross the canal via the bridge. Proceed along Sheets Heath Lane before crossing the main road with care to take the access road to Brookwood Station. Using the main door, pass through the station tunnel to enter Brookwood Cemetery. Turn right onto Pine Avenue. When you reach (behind the blue arch) graves of Turkish airmen, pause to see the ancient gravestone dated 1836. At the triangular junction, bear left down the hill, and through a gate onto a tarmac drive. Take the next turning on the right and subsequently turn left to pass through the ‘Memorial to the Missing’. Turn left onto Long Avenue and pass the Czechoslovakian plot (right). Pass through a gate. Check out the Nicols mausoleum (left) and graves of Freienbergs (shaped like a lighthouse) and Jacobsson (alongside) in the Swedish section. Turn into Oak Avenue to find the graves of Roberts and Girouard before continuing on Long Avenue, crossing Railway Avenue and bearing right. On your left pass Croll, Brunlees, and the very last on this side: Bestall, before reaching a main road. Cross to the other part of the cemetery. To the left of the main tarmac drive find in the trees the grave of Falkiner (in Grecian dress), then the bust of Leitner, and much further on the Celtic cross memorial to Wolfe-Barry. At the church fork right into St Chad’s Avenue. 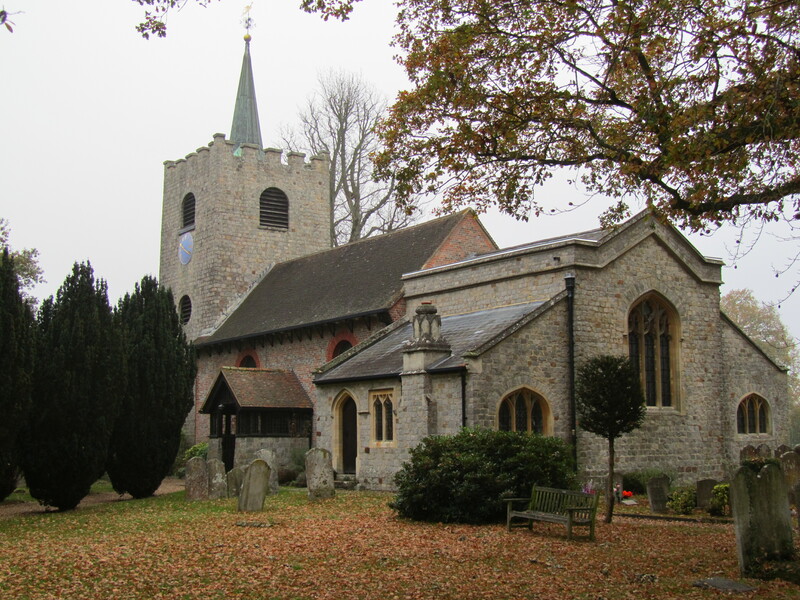 Here look for Hume (shaped like two fingers) and Fildes on the left, then after the Serbian Orthodox Cemetery find Aladin in the trees, opposite the imposing grave of Balfour. Further on, on the right look for Thomas Willes Chitty. At St Mark’s Avenue, turn left noting the distinctive lych gate of St Alban’s parish plot. After 550m pass a newish (2005) grave alongside bird feeders on a tree, then on leaving the cemetery take the right fork to a crossing with a broad, grassy track. Cross onto a wide, muddy path through trees. At the barrier turn right onto a byway and reach a tarmac lane. Turn left, pass three properties, then take a track to the right – Whites Lane. At the end go left, but just before Whites Farm take the Public Footpath (look for the partially hidden sign) right through a new gate. Bear left but diverge from the boundary of the field towards a similar gate 60m from the left corner (look for the yellow waymarker sign) and proceed over the bridge and straight along the path through the wood and subsequent plantation. At the very end of the path, turn left along the track which becomes a tarmac drive and passes Cricketers Cottage to reach a road. Turn left. Pass The Cricketers pub and Cherrywood Children’s Nursery on your left, to return to The White Hart pub. This route was last walked on 8 February 2019, and the directions were accurate then. Please e-mail me if you find any errors, if you would like a copy in Word format, or if you would prefer a version that starts and ends at Brookwood station.